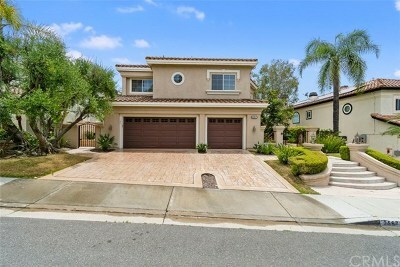 Pacific Hills homes for sale are located in a picturesque family-friendly community in the rolling hills of South Mission Viejo just a short 15 to 20 minutes from the Irvine Spectrum and John Wayne Airport. The Pacific Hills neighborhood boasts two wildlife-protected canyons as well as Fieldcrest Park with a soccer field, full-court basketball, picnic areas and a playground. Pacific Hills homes for sale are a top choice for Mission Viejo buyers. With nearly 1200 homes in the community, it isn’t hard to find a newer Mediterranean style house with a cul-de-sac location, a panoramic view of Saddleback Mountain or a city-lights view, an oversized lot with a pool or even a four car garage. Many Pacific Hills residents enjoy a challenging bike ride in the nearby trails at O’Neil Regional Park or just walking their four-legged friends to the adjacent La Paws Park. The Pacific Hills homes for sale are 1500 to 3700 square feet and vary in price from about $700,000 to 1.2 million. There are 12 different neighborhoods of Pacific Hills homes for sale: Anacapa, Azure, Bonaire, California Crest, Expressions, Lewis Homes, Napoli, Pacific Heights, Paloma, Promontory, Sunesta and Seasons. Pacific Hills was built between 1990 and 1997 by the builders Barratt, Brighton, Buie, Fieldstone, Kaufman and Broad, Lewis Homes, UDC Homes and Standard Pacific. The floorplans of Pacific Hills homes for sale are available on request from the Mission Viejo Realtor Mark Thoburn. Pacific Hills is fortunate to be located in the Capistrano School District. The children attend one of two blue-ribbon elementary schools - either top rated Bathgate Elementary or Philip J Reilly Elementary School which also scores well. As the children get older, many of them enjoy the tradition of walking down the hill to Newhart Middle School currently rated a Ten out of Ten by Great Schools. The carpooling continues as the children attend Capistrano Valley High School which sends its graduates off to some of our finest colleges and universities. Just a mile from the Five Freeway, Pacific Hills homes for sale sit between La Paz and Oso Parkway east of Marguerite Parkway and west of Felipe. It’s just a few blocks to either Ralphs or Pavilions and just minutes to favorite restaurants like Wine Works or the Dublin 4 Gastro Pub. The Shops at Mission are nearby and world class beaches are only twenty minutes away. Pacific Hills homes for sale enjoy Lake Mission Viejo privileges including boating, bass and trout fishing, sailing classes, free concerts and endless summer fun. Mission Viejo realtors Mark and Theresa Thoburn have raised their family in Pacific Hills for eleven years now and know you will enjoy calling it home as well. For private tours of Pacific Hills homes for sale or for a free market evaluation with the most recent comparable real estate sales showing your Pacific Hills home’s current value, call or text Mark Thoburn at 949-378-7222.